Last week, Nigeria successfully completed a $1 billion Eurobond sale on the international market. In fact the bond sale was oversubscribed to the tune of $ 7.8 billion at an interest rate of 7.88%. However, we can only access the $1 billion originally requested for, as this is the amount approved by the National Assembly. While, this does not in any way mean that our economic woes are over, it is something to be pleased about as it shows that our friends abroad still have some faith in our economy. What I am going to try and do in this post is to explain what an Eurobond sale actually means and its implications for our economy. I think before we proceed to explain what an Eurobond is, we should even start from what a Bond is. I tried to look for the simplest and most basic definition and here is what I found “a bond is an instrument of indebtedness of the bond issuer to the holders”. When companies, governments etc. wants to raise money to finance certain projects, they have various means of doing so can do, they can take Bank loans or issue bonds.By issuing bonds, they borrow money from the general public or a certain class of investors and agree to payback these funds after a specific period of time and at a given interest rate. 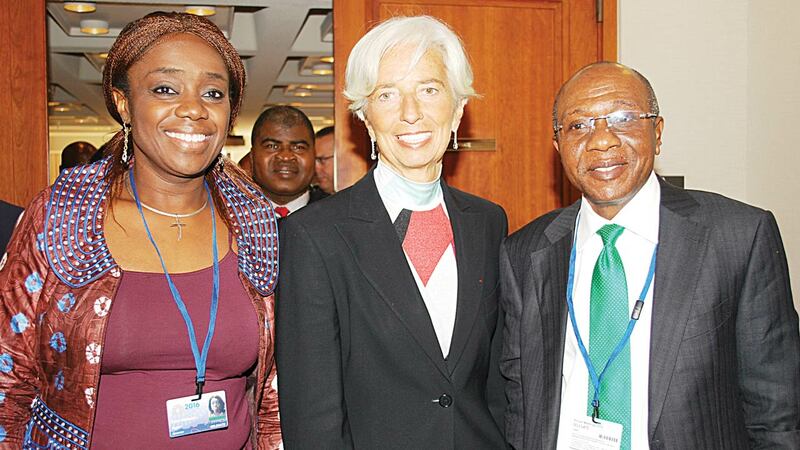 From left to right: Nigeria’s Finance Minister, Kemi Adeosun; IMF Boss, Christine Lagarde and Governor, Central Bank of Nigeria, Godwin Emefiele. So what is an Eurobond? From its name, you would be forgiven to think that an Eurobond has something to do with Europe’s Bond Market or the Euro itself but that is highly inaccurate. An Eurobond is simply a bond which is issued in a currency different from the currency of the country where it is issued. In fact, an Eurobond can be named in terms of the currency it is actually issued in. For example, Nigeria’s $1 billion Eurobond issue is actually an ‘Eurodollar’ as we are actually borrowing the money in Dollars, if we had issued the money in Japanese Yen, it would have been an ‘Euroyen’. I hope it is clear now? Why are we even borrowing? We are broke, and we need money to finance our proposed $7.29 budget, so the government claims that we are going to use the proceeds from the Eurobond issue to finance capital expenditure in the budget. First, the successful issuance of this bond shows that investors still have confidence in the Nigerian economy. I think this is due to the fact that oil productions levels have started to pick up again and also global crude oil prices have been showing an upward trend recently – these two events certainly bode well for our economy and therefore increases investor confidence. Second, depending on how we judiciously use this money, it can be used to bridge some of the infrastructure deficits in the country especially in critical sectors of the economy like power which is facing serious liquidity issues and is on the brink of an imminent collapse. To be clear, $1 billion is just a dip in the bucket relative to Nigeria’s infrastructural needs. To put this in context, former Finance Minister, Okonjo-Iweala once said that Nigeria needs approximately $14 billion to meet its infrastructural needs. So don’t get too excited. Third, the decision to borrow money from the international market rather than domestically is good for our private sector as money that hitherto would have been lent to the government is now available for use by the private sector. If such a huge amount was borrowed domestically, it would have shot up the interest rates, thereby making it more expensive for businesses to borrow money locally. The success of this debt issuance is solely contingent on how we utilise it. If we use it to actually finance capital projects, then it would be truly beneficial. However if we use it to fund these extremely frivolous recurrent expenditure in the budget, we would have wasted everyone’s time and put the economy in great danger. Second, this bond issuance has put greater pressure on the government to diversify its export base. This bond was issued in dollars, therefore we need to pay back in dollars. If we are able to get back to the pre-2014 crude oil price levels within the 15 year period then halleluyah! !, we should be able to pay back. If not, we had better start thinking hard about where we intend to get this dollars from. In relation to the above, if the Naira depreciates even further, it would make it more difficult for us to pay back this debt. In conclusion, the success of this Eurobond sales shows that investors still have a certain measure of confidence in Nigeria. The onus thus lies on the government to utilise these funds judiciously and ensure that it is used to the benefit of our commonwealth. They need to provide us with a detailed break down of how, and what this $1 billion will be spent on as well as specific timelines on each task/project, so we can hold them accountable.